Joy Kirsch, CFO of Life Changing Events at Kirsch & Associates, presents her session about transition planning for women to a packed room at Women, Wealth & Wisdom in 2015. Joy Kirsch, CFO of Life Changing Events at Kirsch & Associates, is the keynote speaker at the upcoming Women, Wealth & Wisdom workshop in Irving on March 2, 2018. 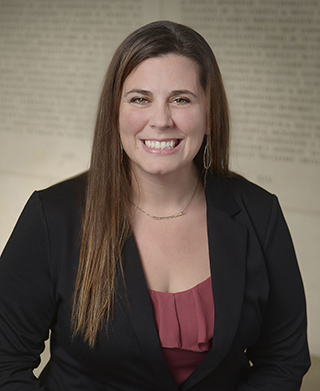 Kirsch previously spoke at Women, Wealth & Wisdom in College Station in May of 2015 and presented her session, "Love, Money and Loss" which focused on wealth management and transition planning for women dealing with a loss. It proved to be one of the most popular sessions of the entire event that year, so she agreed to share more of her insight about overcoming stress and thriving in the middle of life's roadblocks. Women, Wealth & Wisdom is a free event sponsored by the Office of Gift Planning at the Texas A&M Foundation in order to educate, empower and inspire women. 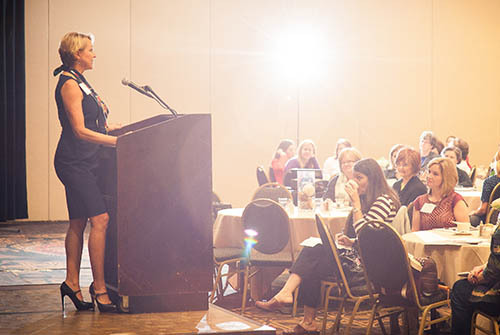 The North Texas Women, Wealth & Wisdom will feature Kirsch as the lunch keynote speaker as well as a breakout session with two different options afterward. For more information on our speakers and sessions as well as to reserve your spot for our North Texas workshop, visit our event page. We will also host a full-day workshop in College Station on May 18, 2018. My friend and CPA, Carre, has a sign on her door that reads: "Keep Calm and Carry On." It helped to put my tax bill into perspective (and also made me chuckle). It seemed like an appropriate reminder for any woman who is in the midst of the grief and confusion created from a life transition. Maybe in the 21st century, we need a new version of the "Keep Calm and Carry On" motto. Maybe instead we should say "Keep Calm and Carry Very Little." It's evident that in the modern world, where we are exposed through numerous media outlets to the world's disasters, we need to develop a skill set that allows us to be resilient when experiencing all of life's tragedies, or even learn to thrive while life happens. Learning to handle ourselves during personal and universal pivotal moments can set the stage for how the rest of our lives look. Life's tragedies require transitions where competent decision-making is more important than ever, yet less likely than ever. Without help, many women will emerge from the other side at a serious disadvantage rather than positioned to thrive. According to the National Center for Women and Retirement Research, nine out of 10 women will be solely responsible for their finances at some point in their lives, and being prepared for this is vital to our emotional and financial well-being. So, let's take a moment to deconstruct "Keep Calm and Carry Very Little." These are powerful tools to calm the mind and body, and everyone under stress will benefit by making it part of their daily routine. Carrying very little involves designing a life that is as streamlined as possible. It also involves asking for help, even doing things that you could easily handle before your transition event. It involves taking care of yourself and setting goals that are financially attainable and not emotionally or physically taxing. One way to streamline may be to have someone help you set up your bills to be paid online. Another way would be to make a list of everything that needs to be done and focus only on the most important and urgent, leaving the other decisions for later. Make sure that you set up a system to allow you to manage and track all the multiple projects that require your attention since your cognitive abilities will not be at their full capacity during this time. Keeping calm and carrying very little is about avoiding making regrettable or unnecessary decisions so that you can move forward with confidence and a sense of purpose. Healing from grief and trauma takes time, maybe years. But it is possible to set up systems and to seek guidance that allows you to feel a sense of hope and forward movement while the healing continues. Ideally, traumatic life changes can lead to a new future of your choosing. Transitions done well can be transformations. JOIN US FOR WOMEN, WEALTH & WISDOM - NORTH TEXAS!